Vegetables are increasingly recognized as essential for food and nutrition security, yet neither the economic nor nutritional power of vegetables is sufficiently realized. To tap the economic power of vegetables, governments will need to increase their investment in farm productivity (including improved varieties, alternatives to chemical pesticides, and the use of protected cultivation), good postharvest management, food safety, and market access. 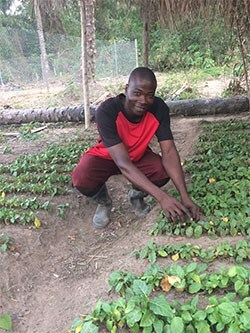 To tap the nutritional power of vegetables, consumers need to know how vegetables contribute to health, and find them at affordable prices or be able to grow them themselves. The results of a study of 300 farmers who had received IPM training show that the training led to an increase in farmers' knowledge about sound pest management methods and increased adoption of IPM practices. For eggplant, the training led to a 30% reduction in synthetic pesticide use and about 30% increase in profits. For bitter gourd, the study found that the training led to a reduction in the total number of sprays (from 21 sprays to 16 sprays per season), but there was neither a reduction in the total quantity of synthetic pesticides used, nor did it increase profits. This study analyzes the adoption of tomato (Solanum lycopersicum) and African eggplant (Solanum aethiopicum) varieties developed through international agricultural research, released by national agricultural research and extension systems (NARES) and supplied to farmers by private seed companies in East and Southern Africa from 1990 to 2015. We found that 50% of tomato and 98% of African eggplant commercial seed production in the region were varieties developed by the World Vegetable Center. WorldVeg and NARES invested US$ 6.9 million in research, extension, and promotion of these two crops. This generated economic gains of US$ 254 million for tomato and US$ 5 million for African eggplant in Tanzania up to 2014. The internal rate of return is 29.3% for tomato and 12.3% for African eggplant, though we project the latter to increase to 26.0% by 2024 as adoption only started in 2007. These results indicate international research into vegetable improvement to give returns to investment that are as high as those previously reported for some staple crops. After the sequencing of the cucumber (Cucumis sativus), watermelon (Citrullus lanatus), and melon (Cucumis melo) genomes, bitter gourd became the fourth cucurbit species whose whole genome was sequenced. However, a comprehensive analysis of simple sequence repeats (SSRs) in bitter gourd, including a comparison with the three aforementioned cucurbit species, has not yet been published. We identified a total of 188,091 and 167,160 SSR motifs in the genomes of the bitter gourd lines ‘Dali-11’ and ‘OHB3-1,’ respectively. The SSR content, motif lengths, and classified motif types were characterized for the bitter gourd genomes and compared among all the cucurbit genomes. Surveys were conducted in 2014 and 2015 in Southern and Northern Benin, respectively, to identify the viruses infecting peppers (Capsicum spp.). The samples were screened by ELISA for cucumber mosaic virus (CMV), pepper veinal mottle virus (PVMV), potato virus Y (PVY) and tomato yellow leaf curl virus (TYLCV). A generic reverse transcription PCR (RT-PCR) was used to test for the presence of poleroviruses. ELISA tests confirmed the prevalence of all viruses, while the RT-PCR detected pepper vein yellows virus (PeVYV) which is reported for the first time in Benin. A further, divergent polerovirus isolate was detected from a single pepper sample originating from southern Benin. Screening of samples collected from solanaceous plants during virus surveys in Mali (conducted in 2009) also detected this divergent polerovirus isolate in two samples from African eggplants. The complete genome sequence was obtained from the Mali isolate using transcriptome sequencing and by conventional Sanger sequencing of overlapping RT-PCR products. Based on the sequence characteristics of this isolate we propose a new polerovirus species, African eggplant yellowing virus (AeYV). This paper analyses governance structures in Uganda’s smallholder pig value chains by applying the New Institutional Economics framework. It utilises cross sectional and qualitative survey data from randomly selected pig value chain actors in 4 districts. The findings indicate that most relationships at the pig production node of the value chain are based on spot market governance structures supported by personal relationships and trust. High integration levels of the pig traders are positively influenced by access to market information, value of investments in the value chain, and dedicated asset specificity in terms of backyard slaughter premises. This study determined the level of phytonutrients in mungbean and soybean sprouts compared to mature mungbean grain and vegetable soybean. Sprouting mungbean enhanced vitamin C content 2.7-fold compared to mature mungbean grain. The vegetable soybean stage was superior to soybean sprouts in terms of content of protein (14% increase), Zn (45%), Ca (72%), and Fe (151%). Isoflavones, reported to have beneficial effects on human health, are found at high concentrations in soybean sprouts. The combined effect of school gardens linked to complementary lessons and promotional activities on the eating behavior and nutritional status of 9- to 15-year-old schoolchildren in Bhutan was studied. Data from 468 schoolchildren in 9 control and 9 treatment schools was collected following a randomized controlled trial design. We found that the school gardening intervention significantly increased children’s awareness about vegetables, their knowledge about sustainable agriculture, and their preferences for healthier foods. There was an 11.7-percentage point increase in the probability that children included vegetables in their meals (p < 0.05), but not in the number of different fruits or vegetables consumed. This study evaluates the combined impact of school gardens linked to complementary lessons and promotional activities about gardening and nutrition on the nutritional awareness, knowledge, perceptions, eating behaviour and nutritional status of 10- to 15-year-old schoolchildren in Nepal. After one year of intervention, we found a significant (p < 0.01) increase in children’s awareness about fruit and vegetables, their knowledge about sustainable agriculture, their knowledge about food, nutrition and health and their stated preferences for eating fruit and vegetables. However, these improvements in intermediary outcomes did not translate into significant improvements in fruit and vegetable consumption or nutritional status.